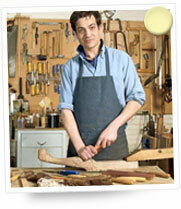 How expensive is it – relatively speaking – to have something made by Pacifica Custom Woodwork? We pride ourselves on producing high-end work for much less than a high-end shop would charge. But we won’t kid you; we cost more than Home Depot, Lowe’s, or other “big box” stores that pass their contracts to third parties. We can’t compete with them – and we don’t want to. What one gets there is “semicustom” cabinets – mostly mass-produced parts selected and organized to fit the floor plan you select. Our work is completely custom, and the materials we use are superior to those commonly used to build mass-produced cabinets. How are your materials different? Ah, now THIS is one of the conversations we love to have! Even if you are not considering us for your custom work, we hope you’ll pay attention here; it’s useful information for you to consider – especially when you are buying cabinets. * Second, there’s the veneer that makes panel stock look nice. A thin plastic film over panel stock is cheaper than a real hardwood veneer, and it saves on staining and finishing costs, so film veneers are commonly seen on inexpensive cabinets. The film looks nice enough initially, but there are a few problems. One is that moisture frequently gets under the film, and then is trapped there – causing the MDF or particle board to swell. Another is that the plastic veneer is often seen adjacent to real wood or plastic “wood”, and they don’t react the same way to light. Over time, the parts that were color-matched will no longer agree. Real wood – whether veneer or solid – will react similarly to light, and color discrepancies over time will be minimal. What if I don’t have a design? I have sort of an idea of what I want, but I’m not very good at picturing it. This is one of our specialties. We will sit with you and go over the possibilities until we have a concrete image of what you want. We’ll take that input, make a drawing and present it to you. Once you actually see your ideas on paper, you might want them tweaked a bit. No problem; the initial drawing and the first modification are free. Or – you might have seen something in a magazine or catalogue that is close to what you want, but not quite there. We can work from that as well. We haven’t lost a client yet; the process is part of the fun!